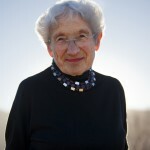 Ruth Adler Schnee is a living legend of modern design. Arriving to the United States from Germany after escaping the Nazi regime in 1938, Schnee embarked on a pioneering career in textiles and environmental design that would help shape modernism in the 20th century. With masters like Paul Klee, Raymond Loewy, Frank Lloyd Wright and Eliel Saarinen as her teachers, Schnee forged a path through the design world at a time when few American architecture or design firms would hire Jews or women. A maverick purveyor of modern design ideals, Schnee brought modernism to Michigan with the groundbreaking retail store Adler-Schnee, which she founded with her husband. As an artist, she devoted her career to the search for innovation in form, texture and color. Ruth represents the indelible force of women designers on the built environment, and at the age of 91 she continues to live and create in metro Detroit, designing building interiors and woven textiles, and as an active preservation advocate for the city’s modernist history. Schnee’s pioneering work as an artist and leading designer are being celebrated on a grand scale as she is named the 2015 Kresge Eminent Artist. Since 2008, Kresge Arts in Detroit has annually honored an exceptional artist for lifelong professional achievements and contributions to the cultural community of metropolitan Detroit. The Kresge Eminent Artist Award, administered for The Kresge Foundation by the Kresge Arts in Detroit office of the College for Creative Studies (CCS), includes a $50,000 award that acknowledges artistic innovation, integrity and depth of vision. We extend our sincere appreciation to the Kresge Arts in Detroit Advisory Council for selecting the 2015 Kresge Eminent Artist. CCS shares The Kresge Foundation’s recognition that artists are a critical force in the continued vitality of our region and we appreciate the vision and investment that makes the Eminent Artist award possible. Ruth Adler Schnee is a formidable trailblazer in her field, and, like her fellow Eminent Artists, her career has had an extensive and lasting impact. We salute Ruth for her outstanding contribution to the cultural life of Detroit – a contribution that continues to impact, inspire and enliven.